Rising demand for high-quality yield especially in the developing agro-based economies across the Asia Pacific, will augment the global adjuvant agriculture market size. Adjuvant agriculture play a key role in enhancing the productivity of all the major chemical agents used to remove unwanted pests, insects, and other plant infections. They also help in enhancing crop productivity by promoting sustainability and increasing agrochemical efficiency. The escalating demand for high-quality & quantity yields from developing countries for serving the ever-growing population is expected to lead to a greater requirement for food crops in the near future, augmenting the industry trends. 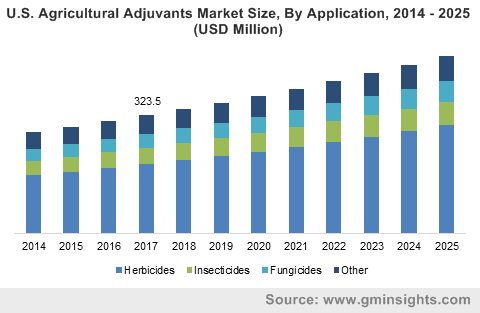 Herbicide is indeed the largest application segment of adjuvant agriculture market, as per a report by Global Market Insights, Inc. Currently, weed resistance is one of the most significant issues faced in the pest control industry. The product is used to control weed growth, which if untreated could reduce the product yield and quality. On account of the near ubiquitous use of herbicides in major crop varieties, adjuvant agriculture market share from herbicides is expected to register a CAGR of 5% over 2018-2025. As a matter of fact, genetically engineered herbicide-tolerant yields now account for about 56% of the usage of global glyphosate – a key herbicide compound. Glyphosate undeniably remains the utmost widely used herbicide in the world, supporting interest in quantifying human health and ecological impact. Accurate, accessible time-series data on glyphosate use is certain to propel research, further fortifying adjuvant agriculture market from herbicide applications. Strictly speaking, activators are one of the most prominently used adjuvants in agriculture, driven by the fact that these products effectively improve the herbicide activity when sprayed on weed affected crops. Salt adjuvants are also used as activators in a bid to fertilize crops in the short-term. On account of their incredible advantages, activator-based adjuvant agriculture market size stood at USD 1.5 billion in 2017. The rising population and the subsequently growing demand for food crops are certain to boost the regional adjuvant agriculture market. That said, the nation is also characterized by highly evolved technological advancements, which in conjunction with the limited land availability will bolster the U.S. adjuvant agriculture market growth. As per reports, in the U.S., since 1974 to 2016, more than 1.6 billion kg of glyphosate active ingredients have been utilized – which comes down to around 19% of the projected global use of glyphosate (8.6 billion kg). Moreover, from 1974 to 2014, 2/3rd of the total volume of glyphosate used in the U.S. has been sprayed in the last 10 years, which is equivalent to 72% of the global share. In 2014, agriculturalists sprayed enough glyphosate to apply approximately 1.0 kg/ha on each hectare of U.S.-cultivated croplands and approximately 0.53 kg/ha on all croplands worldwide. The usage of these herbicides is only projected to surge in the ensuing years, which would eventually expedite the U.S. adjuvant agriculture market. In fact, powered by the contribution of the U.S. and Canada in particular, North America adjuvant agriculture market valuation is forecast to cross USD 800 million by 2025. For that matter, in terms of pesticide production and deployment, the U.S. has been on the forefront for quite a while now. As per estimates, global pesticide expenditure at the producer level totaled nearly $56 billion in 2012, while the U.S. pesticide expenditures at the producer level totaled nearly $9 billion in the same year. Prior to 2012, the region’s expenditures accounted for 18% to 16% of world’s total pesticide expenditure, while in 2012, U.S. expenditures accounted for 21% of the global spending on herbicides, 14% on insecticides, 10% on fungicides, and 23% on fumigants. Quite overtly, these trends speculate a rising growth rate for the U.S. adjuvant agriculture market in the upcoming years. Adjuvant agriculture are indeed a key agent for the agro industry as they help improve farm productivity and control the growth of pests and other unwanted plants. Herbicides and pesticides are the most common applications of these products. The requirement for genetically engineered agriculture adjuvants will surge in the developed economies in the future, while in emerging agro-based economies the demand of adjuvants will spur due to the escalating requirement of bio-based products. Driven by the rising R&D programs in biotechnology and the surging need to increase product efficiency, global adjuvant agriculture market is expected to traverse alongside a profitable growth path in the years ahead.